Catie Munnings will fly the flag as a PEUGEOT UK Ambassador at the 2019 European Rally Championship (ERC) Junior Championship in 2019. Joining the PEUGEOT Rally Academy for 2019, 21-year-old Munnings has her sights set on the ERC3 category front-wheel drive competition, hoping to emulate past success. In 2016 Catie Munnings became the first Briton to win a European Rally title in almost 50 years after taking the Ladies European Rally Championship title, in her first competitive year in the sport. A natural in her field, Catie will be joined by new co-driver Veronica Engan for the campaign that lasts from March through to October, beginning with the first round in the Azores on Thursday 21st March. The 2019 European Rally Championship takes drivers across a range of technical and challenging terrains, from gravel tracks to tarmac roads in The Azores, Latvia, Rome and then finishing in Hungary. Munnings has already attracted the attention of some big names in motorsport, entering the PEUGEOT Rally Academy as a customer with Saintéloc Racing, and having the backing of Red Bull. Aside from building a profile on the track, Munnings has broadened her fan base as a children’s TV presenter with her very own CBeebies drive show, ‘Catie’s Amazing Machines’. Laurent Guyot, Manager of Customer Competition Programmes at PEUGEOT SPORT said: “It is a great privilege to work with Catie Munnings this season. Catie has proven to be a great brand ambassador and inspiration for young people wanting to get into motorsport. 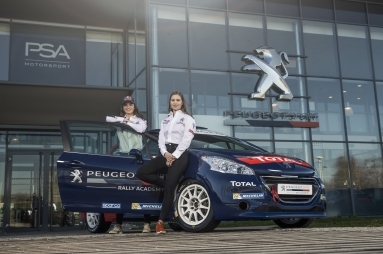 Catie Munnings is one of several promising names in the sport to be working closely with PEUGEOT in 2019 as the brand renews its partnership with last year’s 208 Rally Cup winner; Yohan Rossel. Yohan, and his co-driver Benoît Fulcrand, will be Catie Munnings’s teammates in entering the European Rally Championship and the FIA ERC3 with the PEUGEOT Rally Academy. The first stage of the ERC Junior Championships will be taking place from Thursday 21st March to Saturday 23rd March in the Azores.